Ships today if you order in the next 13 hours 21 minutes. Chlorella is a freshwater green algae that contains more chlorophyll than any known plant. It is used to boost the immune system and help fight infection. The algae has been popular in Asia for centuries as an energy-producing food. Chlorella is considered a superfood. It contains 18 amino acids, 60% protein, chlorophyll, beta-carotene, more than 20 vitamins and minerals, and other phytonutrients. Yaeyama chlorella is grown on a coral reef island called Ishigaki in Japan. This highly digestible, nutrient-rich algae is spray dried using a process that breaks the cell wall without disturbing its nutrients. 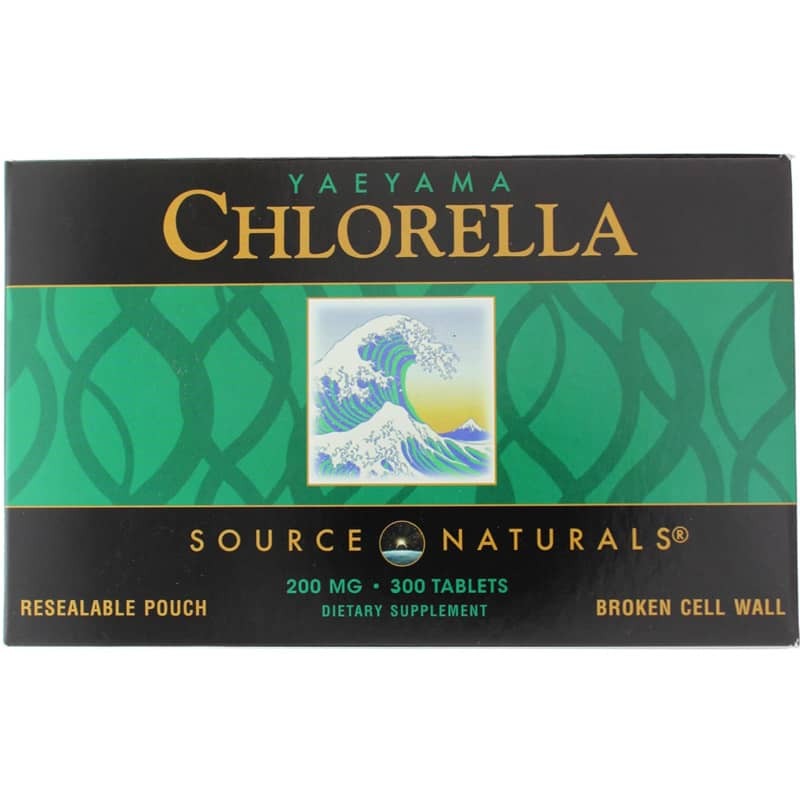 Yaeyama Chlorella by Source Naturals is a 100% freshwater, 100% organic, broken cell wall chlorella that is free of fillers, binders and excipients. Studies show that outdoor-grown chlorella such as this contains more chlorophyll, protein and carotenoids than tank-grown chlorella. 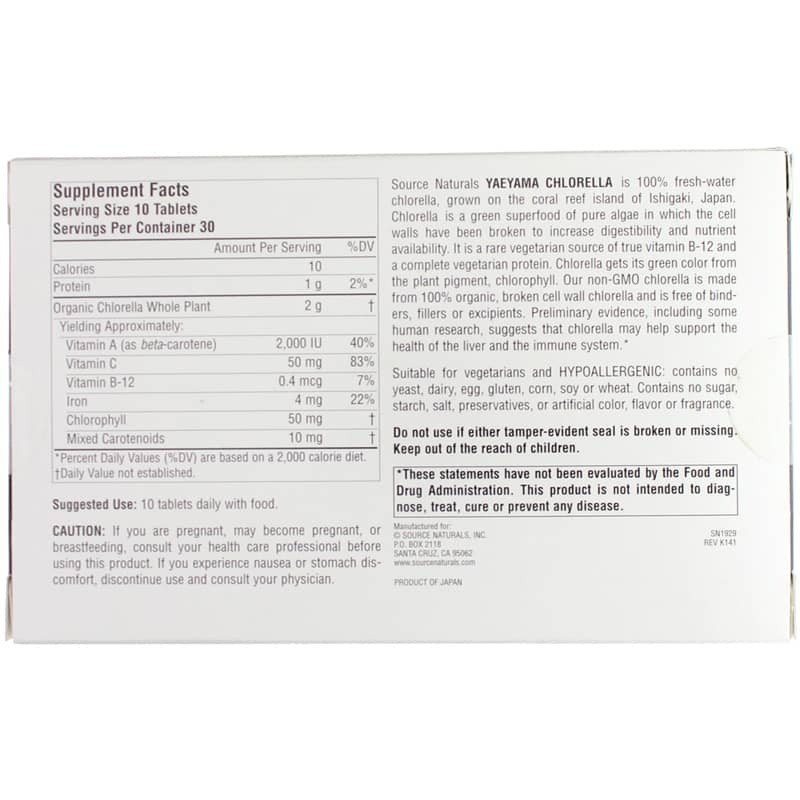 If you're looking for the most nutritious Chlorella pyrenoidosa, check into Source Naturals' Yaeyama Chlorella. Order online today! Contains NO: yeast, dairy, egg, gluten, corn, soy, wheat, sugar, starch, salt, preservatives, or artificial colors, artificial flavors or fragrance. Suitable for vegetarians and hypoallergenic. Adults: Take 10 tablets daily with food. If you are pregnant, may become pregnant, breastfeeding, or taking any prescription drug, consult your health care professional before using this product. If you experience nausea or stomach discomfort, discontinue use and consult your physician. Keep out of the reach of children. I have been taking chlorella for years. More expensive brand was first prescribed by my healthcare professional, but I found this to be a close second in quality and infinitely more affordable! I also give to my daughter. I take 10 every morning and within 10-20 minutes I do not feel hungry anymore because my body gets all of the nutrition it needs from the chlorella. I have lost quite a bit of unwanted weight since I started taking this and I feel like this product gives me an overall sense of wellness and health. These days I only take turmeric, red ginseng, and this and I feel on every day.